Having been around for millennia, wine, and the methods we’ve used to preserve it, have aged tremendously. Instead of being kept in clay pots in the hot sun, we’ve learned how to properly store it and what to store it in. We now have people dedicated to studying, making, and even tasting wine. Nearly every country in the world makes and sells their own wine, with some being worldwide phenomena while others are more local hero types. In today’s blog, Just Store It!, the storage experts in Clarksville, will go over how you should be storing your wine to preserve both the flavor and life of your wine for as long as possible. Heat will ruin your wine faster than a bunch of ants taking over your picnic. Anything over 70 degrees fahrenheit will cause your wine to age quite rapidly, and anything hotter than 70 may even result in flavor loss. The sweet spot for most wines is between 45 and 65 degrees fahrenheit, with 55 usually considered to be absolute perfection for wine. On the opposite end, you don’t want your wind to get too cold. Storing most wines in your refrigerator is fine for a few days or months depending on the wine, but anything longer than that could cause the wine to lose its flavor. Storing your wine in the freezer is never advised as the wine could freeze, which would damage the wine. Storing your wine in a place that doesn’t experience dramatic temperature changes is key. Severe and frequent temperature changes can cause a cooked like flavor to form in your wine, and the constant changes in temperature will cause your wine to expand and contract, which could eventually cause the cork on your wine to come off. So, not only could you have your wine lose its great taste, but you may lose most of or the entire bottle if you don’t store it in the right place. 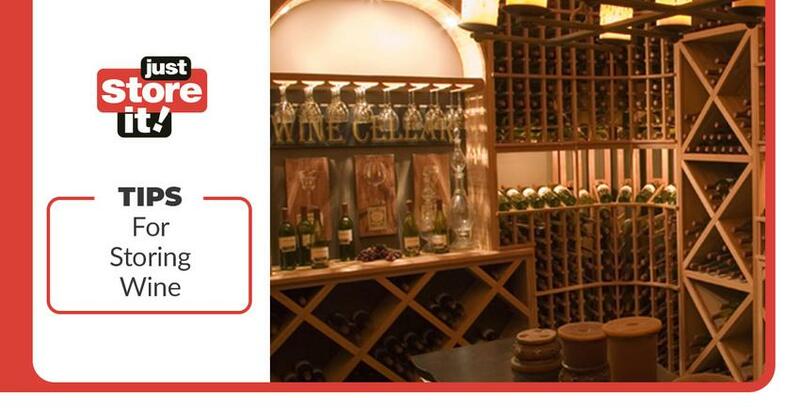 Places with temperate, mild climates or climate control settings are perfect for storing wines of all variety. Much like vampires or certain archeological professors looking for a golden idol, you’ll want to keep your wine out of the light. Natural sunlight can be especially harmful to your wine as the ultra violet (UV) rays the sun emits can cause your wine to prematurely age. Ever wonder why companies and vineyards put their wine in colored bottles? This to help harmful UV rays from penetrating the wine bottle and ruining the wine, acting like a trusty pair of sunglasses and sunscreen for your favorite wine. Most lights you find inside won’t do much damage if any to your wine, but you may find that, over time, your labels will wither and fade. Here at Just Store It! in Clarksville, we have great amenities to that will help keep your wine safe and flavor full. If you’re looking for storage units in Clarksville, then look no further than Just Store It! Learn more about us, see what kind of amenities we offer at our Clarksville storage facility, or contact Just Store It! to answer any questions you may have.